Well the good times keep rolling on. We are now in Tsumeb, Namibia. In our last E-mail we left you at Walvis Bay. We are still travelling with a Kenyan couple and having a really good time. It's an eye opening experience travelling with a Landrover owner. I know a lot more about repairing 20 year old 103 Series Landrovers now than I care to know. Whilst in Walvis Bay we spent a day repairing the Landrover brakes. The next day we travelled to Sandwich Harbour which meant travelling along the beach for 40km's. It was fun however the scenery wasn't very interesting. We saw lots of Flamingos, Seals and a few Dolphins. From here we travelled to Swakopmund which is a very touristy area. Lots of European tourists (especially Germans) come here for holidays. Throughout Namibia lots of people have Rooftop tents - especially the Britz (Australian firm), Maui and Hertz rental 4x4 vehicles. From here we headed north through the Skeleton Coast and visited the seal colony at Cape Cross. There were literally thousands of seals. Su-lin did not enjoy the strong odour in the air. We then headed inland and bush camped on a remote mining track enroute to the Brandberg Mountains. We visited Brandberg Mountain but didn't climb due to the number of tourists. The Landrover broke down again with a blocked carburettor. We camped early at the foot of a mountain range and walked to the top. Near the top we discovered a cave with some impressive well-preserved paintings, which was a real treat. Anywhere else you have to pay. We saw better bushman paintings for free. Next morning we visited the Petrified Forest. On arrival, we were treated to the sound of a Damaralands men’s choir. The harmony was beautiful, enhanced by the excellent acoustics in the rondavel. The petrified trees were very interesting and looked just like an old tree yet these were fossilised rock, supposedly washed down from Angola. We then spent four days travelling through the Kaokoveld Himbalands. This is the north west area of Namibia which borders Angola. 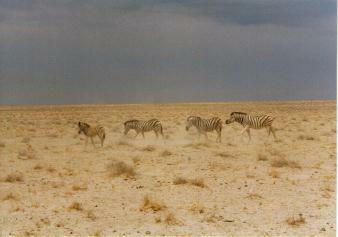 This area is often described as the last true wilderness area of Africa. The roads were slow going. Here we saw our first wild giraffes. The area reminded us of the Gobi Desert and the area around Western China. 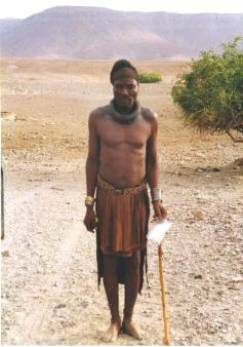 Whilst stopped at a windmill a group of Himba people appeared in their traditional dress (or lack thereof) covered in red ochre, copper arm bands, colourful beaded neck bands and goat skin loin clothes. They were after sugar and medicine to cure suspected constipation, bilateral cataracts and infected leg wounds. We hope that the vitamin pills and Band-Aids we dispensed remedied the ailments. The area was good cattle grazing country with large numbers of very healthy cattle, goats and sheep. Things were going well until the Landrover's chassis cracked. We were able to patch the problem with ratchet straps and headed for Etosha National Park. After five nights of bush camping it was a nice change to spend the next three nights at different camping grounds in Etosha NP. On the first night at the waterhole in Okakeujo we saw fifteen elephants, four rhinos and a very cautious giraffe. It was here that a German tourist was mauled to death a year or two ago, after falling asleep at the enclosed (?) viewing point. In Etosha NP we saw lions, zebra, giraffe, gemsbok, springbok, ostrich, ground squirrel, hartebeest, wildebeest, impala, kudu, warthog, hyena and elephants, and many different kinds of colourful birdlife. This was our first big game park and we were very impressed with what we saw. By now our friend's Landrover chassis had completely collapsed with both the front and rear spring mounting point completely broken off, so we headed to the nearest welder in Tsumeb. This is a beautiful green mining town like Leinster in WA. Unfortunately the mine closed earlier this year and the town has felt the impact. The townsfolk are hopeful that the Copper mine will reopen early next year when the mine sale is complete. The welder in Tsumeb fixed the Landrover's chassis and was confident that we should have no more problems with the chassis. Later today or tomorrow (depending on when we can tear ourselves away from this green oasis) we head for Khaudom NP which is on the border with Botswana. This is a very remote NP with no facilities and can only be visited by two 4x4 vehicles travelling in convoy. From here we will enter the Caprivi Strip and then onto Botswana. We think there is E-mail access in Maun so all being well you should hear from us in around ten day's time. If you write to us, please use our gkingsmill@yahoo.com E-mail account. So for the trip has been easy going however we hear tougher times are ahead. Hang in there with us.